Have you jumped on the shiplap wood planked wall bandwagon? Boy, I have! Thank you very much, Fixer Upper. I’m planning a little shiplap wall project myself (and if all goes according to plan, you’re going to be blown away by the simplicity of it), so I thought it would be fun to share five of my favorites. 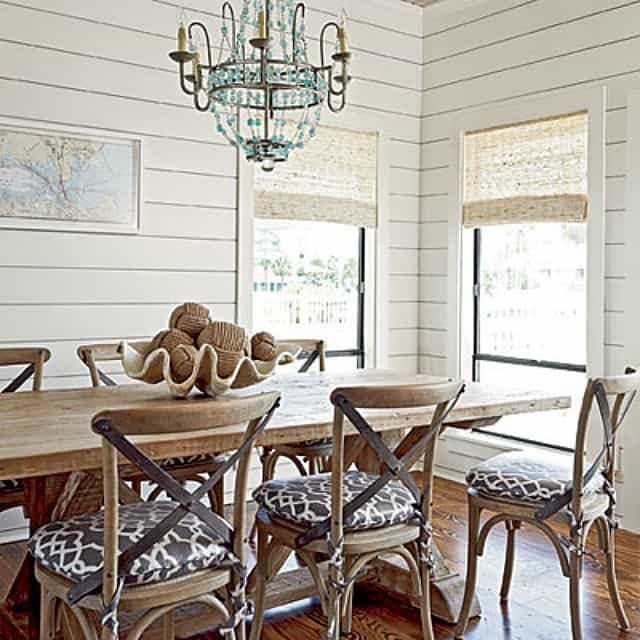 First up is this charming coastal dining area filled with shiplap. 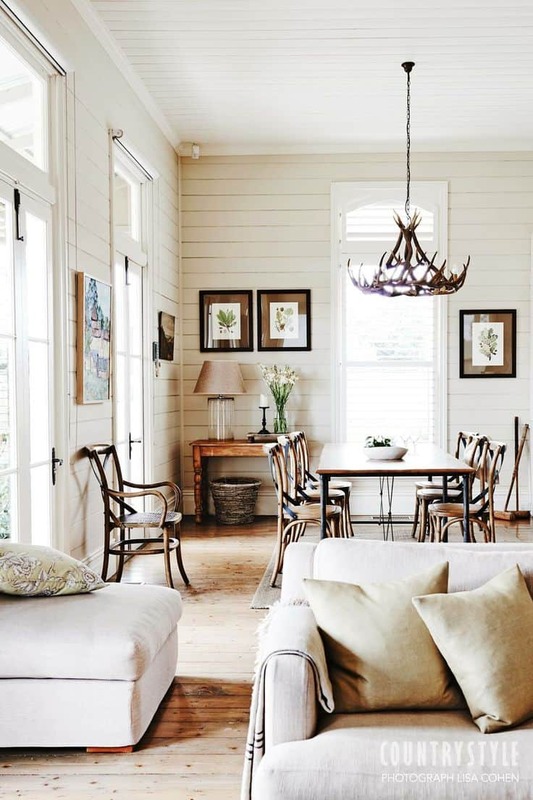 I love the slightly formal chandelier mixed with the rustic shiplap and furniture in the room. This wall is made even better by the addition of chunky, warm, rustic wood. 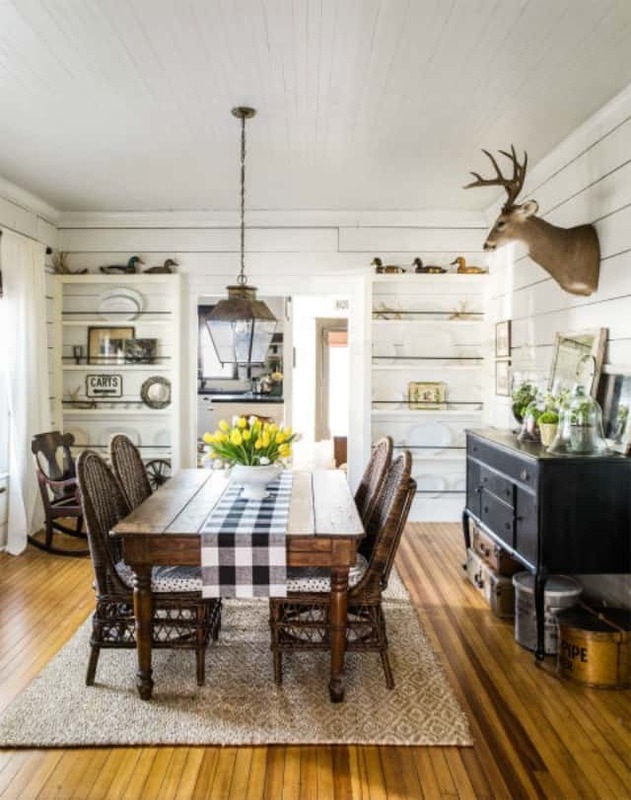 I’m not so sure how I’d like dining here with a mounted deer head staring down at me, but I do adore the overall look of the shiplap in this room. A beautiful mix of rustic furnishings and accessories mixed with classic traditional soft furnishings. Shiplap doesn’t have to scream rustic. It plays well in more modern interiors too. Um…did you notice anything about these faves of mine? All of these fantastic examples are located in an eating area of some sort. Yep – now that I’ve finished my kitchen and breakfast area, I’m ready to move on to my dining room. And I’m thinking that a little shiplap will be just what the doctor ordered! Love, love, love shiplap! Can’t wait to see what you do! Oh my, yes I do love me some shiplap! I’m considering adding some to my home as well! Sharing this on my blog today! Hi Doreen. I love your home and shiplap would be just perfect in it! 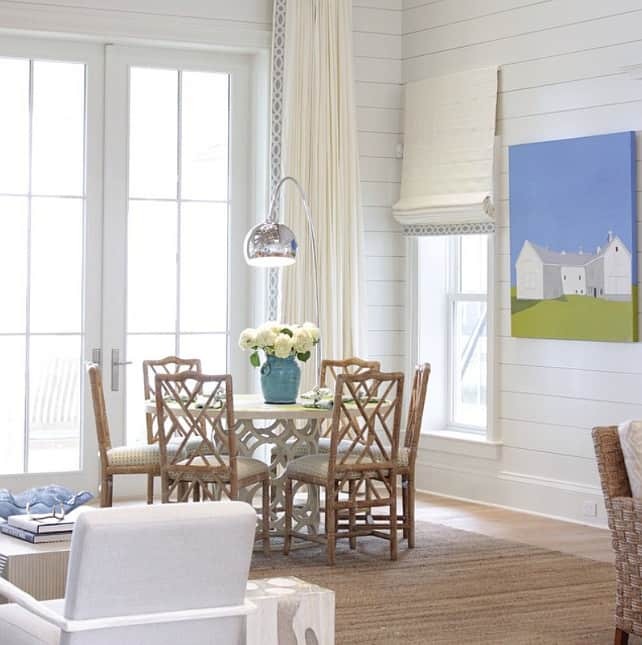 Could you ever see a shiplap wall being painted a color? I have only seen white or stained and like neither for the project wall I have in mind. Hi Kim. Sure, I think it would look great painted. I found quite a few examples on Pinterest when I did a search on ‘painted shiplap’. Can’t wait to see what you come up with. It’s a classic look – I don’t think it would ever look old! Hi Cecilia. I agree with you and sure hope it won’t ever go out of style. My hubby equates shiplap to the old wood paneling craze of the 70’s. Ha! Same here, Donnamae – I had never heard of it either. It’s amazing how just one tv show can influence so many people! We have had ship lap walls in living room for over 35 years. They were natural wood color for 20 years or so until we white washed them. Still love them, glad to see we are in style now. Oooh – that sounds so pretty, Maggi! Way back in the day, I had some of that lovely fake wood paneling that I painted white. I always, always loved the texture of it in the room. I bet yours is gorgeous. Hi Suzy, sow your post on the scoop at stonegable. I’m so excited for you. If I had my own home I would definitely put ship lap in.. My favorite from the five are the one with the wood beam framing the wall. The next one is the BHG photo, but I agree I think I would have a hard time with the dear head also . Hope to see your dinning room. Hi Pamela. Nice to meet a fellow shiplap lover! LOL I’m hoping to get the project completed in February.